Arsenal's Mesut Ozil pictured during tonight's match. THE SIDES WENT in level 1-1 at half-time tonight, but there was no doubt Chelsea had been the better team in the opening 45 minutes. The visitors were controlling the play, as emphasised by one 10-minute period where they had 71% possession — a rare stat to be associated with the away side at the Emirates. Wenger knew his team had been second best, and consequently made a change at the break. The back three is a system that has served Arsenal well in the past — they beat Chelsea 2-1 in last year’s FA Cup final with this formation. So it was no surprise that Wenger chose to revert to this format in the second period, with Mohamed Elneny slotting in alongside Laurent Koscielny and Shkodran Mustafi in defence. 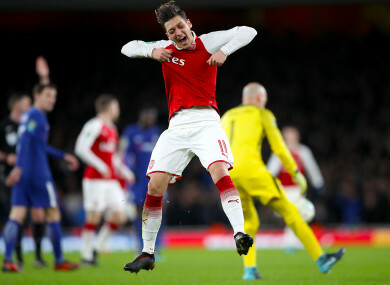 This change, which was acknowledged as pivotal by Granit Xhaka in his post-match interview with Sky, led to a much-improved second-half display from the Gunners — Arsenal had a much better balance to their side, as they controlled the play and dominated possession in a similar manner to how Chelsea had done in the first period. The hosts went ahead in the tie for the first time on the hour mark, after Xhaka pounced following excellent work by the influential Alexandre Lacazette down the right-hand side. And Wenger’s team were well worth their victory in the end — after a disastrous start, they grew in confidence, while Chelsea by contrast faded out of the game and rarely looked like scoring in the second half. It is Arsenal’s eighth League Cup final — only Liverpool (12) and Man United (nine) have appeared in more — but strangely for such an illustrious manager, Wenger has never won the trophy during his two decades-plus time spent coaching in English football. There is no doubt that Chelsea have been significantly weakened over the past 12 months. Diego Costa and Nemanja Matic were always going to be difficult to replace, and the likes of Tiémoué Bakayoko and Danny Drinkwater have struggled to make an impact since arriving in the summer. The Londoners are still third in the league and tonight was their first loss in 13 matches, but they have nonetheless failed to build on the achievements of last season — a feeling confirmed by this evening’s tame performance. It will be the manner of the loss rather than the result that will be of greatest concern to Antonio Conte. The visitors became worse as the game developed — once Arsenal went ahead in the 60th minute, the prevailing expectation was that a late rally would put the home side’s defence under considerable pressure, but if anything, it was Chelsea who looked most liable to concede in the dying minutes. The Blues’ squad depth is lacking in comparison to their main rivals, and recent rumours of the club being linked to ageing strikers such as Andy Carroll and Peter Crouch does little to inspire confidence. Ross Barkley, Michy Batshuayi and Davide Zappacosta came off the bench tonight — all three were completely ineffectual and are hardly the calibre of player a club with expectations as high as Chelsea should be relying on to turn games or win trophies and emulate the success of last season. 3. How many trophies can City win? It may have been a little nervy towards the end, but Man City’s phenomenal season continued ultimately, as they reached the League Cup final on Tuesday at Bristol City’s expense. Even the most ardent Man United supporters will struggle to deny that, barring a dramatic collapse, their neighbours have the league wrapped up — they currently sit 12 points ahead of their nearest rivals with 14 games to play. The Etihad outfit now also have at least a 50:50 chance of winning silverware on 25 February at Wembley, while they are among the favourites to lift the FA Cup and Champions League trophies. It is, of course, too early to call them a great side, but it is difficult to recall many teams who have been as dominant as Pep Guardiola’s men in Premier League history (and even before then). A quadruple is still expecting a lot, given the exhausting nature of the end-of-season run-in, but even two trophies would represent a positive return for a side that have won countless admirers for the style of and substance to their play. Guardiola has yet to claim any major accolades in English football, but that fact is surely set to change imminently. Email “The tactical switch that won the game for Arsenal and more League Cup talking points”. Feedback on “The tactical switch that won the game for Arsenal and more League Cup talking points”.